Hi Cathy, I have read all your books about the children you have fostered and made a difference to their lives. I am touched by them all and have just finished reading your latest book. 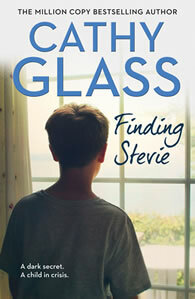 I hope to be a foster carer one day and reading your books makes me more determined to make this dream a reality. I really think you are truly amazing and hope there are plenty more books on the way for me to get even more inspiration. Not only this… But your books help me parent my own children who at times I find a real challenge. Much love to you, your incredibly kind hearted children, past and future foster children. l just finish reading Cruel To Be Kind which l really enjoyed. Your books are brilliant. Can’t wait for your next book. Dear Cathy. I have just finished reading ‘Cruel to be Kind’ and I wanted to say I have thoroughly enjoyed it. The book reduced me to tears in both good and bad ways, and despite the problems and extreme sadness and loss that Max and his family had to deal with. I work as a trainee in a law firm and specialise in family law and child protection law. Your accounts of the legalities surrounding these difficult and often controversial issues is spot on, and provides factual, useful and accurate information. I am thoroughly looking forward to the next book, which I am starting this evening. Keep up the amazing work. Kind regards. Dear Cathy, I have recently started reading your books and have become obsessed with them! I am so moved by your stories. Most of your books have bought me to tears, and as you need small breaks after one child has left you before you foster your next, I am like that with your books. I get so attached to their little lives! Your family too, I have a vision of what you all look like in your home with your late cat. Lucy’s story was the one I read first and it is one of my favourites. I have pre ordered your new book and cannot wait to read it. Just wanted to let you know i think you are amazing!!! Hope this email does not make me sound strange haha! Kind Regards, Your number one fan. I was in the care system from the age of 7 to 16. I wasn’t lucky and was in and out of children’s homes and special schools. This made me become a monster and I have done things I regret to this day. I used to get punched and kicked black and blue and was raped numerous times. I started self- harming and not long stopped. I have 2 boys who don’t live with me as I suffered mental health problems. I see them a lot. When I read Damaged I cried my heart out, never cried so much in my entire life. I then bought few more books and cried at them too. I read them on my tablet of a night when in bed. I just want to say what an inspirational person you are. Even when your husband left (his loss) you managed to bring up your kids, and change the lives of so many others. Maybe I would have been a totally different person today if I’d had a loving caring foster carer like you. I look forward to reading the rest of your book and i always have tissues to hand lol. I enjoy reading your books and it’s like I’m right there with you. I even cry when you do lol I can’t put them down as they are so interesting. Thank you my friend. Dear Cathy, I would like to start by telling you how much of a fan I am. I have been reading your books since I was around 19 and seem to finish each one in a week max! They are so hard to put down. I love them that much you’re your books are pulling me through a hard time. I am currently working 3 jobs to get by as my partner has been made redundant. Your books are my nightly escape from my life, I enjoy them so much I tend to re-read. I am currently reading cruel to be kind (my mum bought it me as a Christmas present. Please don’t ever stop writing! I can imagine you have got many women through lots of different struggles and bad periods in their lives, just like me. Thank you for your time. Hi Cathy, I just wanted to say how much I love your books. As a single parent myself through similar circumstances it is so good to hear about your successes professionally and with your family. It is really heartening. Your fostering is truly awe inspiring. I notice a child’s challenging behaviour is often ultimately explained by something that has happened in their past. It makes me wonder with the anniversary of poor Jamie Bulger’s murder, whether his young killers had something terrible in their backgrounds. Very best wishes to you. Hi Cathy, I’m about four or five books into your foster care memoirs, and I wanted to say thank you. I grew up with an abusive mother, and no close relationships with anyone. I’m still in a similar position, except that now I have two children, aged 8 and 5 years. Something I’ve always struggled with is being able to juggle daily life. I never had a positive role model, and I’ve found that as I’ve listened to your books converted into audiobooks, I’ve found myself with a practical example of how to manage things. I’ve become better at knowing where to draw the line with my children – between what is healthy for them to manage such as tidying their clothes, and asking them to do things that go far beyond their age. This is a line that I was never taught as a child, and have only learnt through hearing you talk about teaching such lines to your children and foster children. I find it healing to live vicariously through your experiences. I grew up in a household where I was yelled at for so much and spanked when my mum couldn’t think of anything else to do, so it’s been my default for several years into my parenting journey. Your experiences have taught me that it doesn’t have to be that way, and given me little things to work on one by one – something that parenting courses have never managed to do for me. My kids and I are closer than we ever were, thanks to you. This single dad is definitely going to continue to work through your books, because they’re worth every cent they cost. Kind Regards. Hey. I’ve just read this book Nobody’s Son. What an amazing book yet again. Another story that touched my heart and brought tears to my eyes. I read it in just 12 hours. Your books are so captivating. I can really connect with your books due to being a care leaver myself. However I must admit I had a wonderful time in care and had the same foster parents throughout my 12 years in the care system. I still lead a normal , family life with them all. I’m currently 37 weeks pregnant myself and due a little girl in just 20 days. I’m absolutely over the moon and so excited for the new life to begin. And to break the circle of my biological family . We are living proof that with the correct guidance and love we can change our lives around. My hat comes off to you. Kind regards. Dear Cathy Glass, I recently celebrated my 16th birthday and I had a cake made in the shape of a book with your name printed on it. I have read many of your books. Although these books are incredibly sad I have enjoyed reading them. My favourite was Damaged. I only started reading about 1 year ago and I am around half way to collecting them all. Yours sincerely. Hi Cathy, you are without a doubt my favourite author. I fall in love with every single book you do! I’ve read them all and look forward to more! You’re an amazing woman and should be very proud of your accomplishments. Kindest regards. Dear Cathy, I felt I needed to contact the author that has kept me gripped for the last year. I am working my way through your books. My 3 year old asks me what is wrong while kissing my cheek as I can’t hold back my tears. Thank you for all you have done for these poor children. I’d love to do what you do but haven’t the space in my home. What you do for each of these children, as well as your own is truly amazing and you should be so proud of yourself. Thank you for allowing me to get lost in your stories. I cannot wait to work my way through more. Very kind regards and warm wishes. Hello Madam Cathy Glass. A friend of mine suggested your book, Damaged, for me to read a couple of days back and I just completed it and felt incredibly heart touched. I am 16 years old and I hope to be a child psychologist one day if all goes well. Your book gave me a personal view about your experience with a troubled child and so much more that is hard to put to words. I just would like to thank you profusely for sharing all those words with the world for people like me deeply appreciate your kindness that keeps our world bright and beautiful. Dear Cathy, I have read three of your books and now nearly finished a fourth. I am continually so inspired by your experiences that I now have ten books in total of yours, and every time I go to the mall, I always have to go to a bookshop to see if I can get more! I am at your persistence, courage, support, and continued belief in children. This is very hard to come by and I am inspired by your works. I have always loved writing and reading which are my biggest strengths. I am very much looking forward to ‘A long way from home’ being released. Hello Cathy, I have read so many of your books and can never put them down. You truly inspire me as I came from foster care myself and I had 2 children removed from me due to my bad habits, a bit like the story you told in Please Don’t Take My Baby. After I fell pregnant for a 3rd time I made it my mission to prove everyone wrong. Your books have helped me reach this and now she’s four and is happy with me and her dad. No more social workers involved since she was one. So a massive thank you for being so special and writing these books. You have truly helped me become a better parent and couldn’t thank you enough. I love reading all your books and have read almost all of them. I so wish i had a foster parent like you when I was younger. Dear Cathy Oh. My. Word. Your books need to be sold with a box of tissues!! What a brilliant read Hidden was, and the most amazing outcome! I cried my eyes out! I love your style of writing but what I love about you personally is that you are so honest about your own feelings, no matter how professional a face you always put on for the children or everyone you deal with in relation to the children. You most certainly have the patience of a saint! Honestly, I really believe foster carers like yourself are truly angels that walk on this earth! This isn’t a job, it’s absolutely a vocation and in my view all the money in the world could never truly compensate you for all that you so selflessly do! Again, thank you for sharing your memoirs with us. It is very eye-opening to hear how it all works from an inside perspective. Take care Cathy and much love to you and your family! Best wishes. Dear Cathy I hope you are well? I just wanted to let you know that I left a review on your book Saving Danny on Amazon. This is the 13th book of yours I’ve read! And have purchased another 4. I apologize that I haven’t left reviews on all of them yet, but I will catch up on that asap. Do take care and thank you again for sharing your memoirs with us. You have incredible insight, intuition and a definite magic touch with all the children you have fostered and written about and many others I’m sure whose stories are still to be told! Bestest wishes. 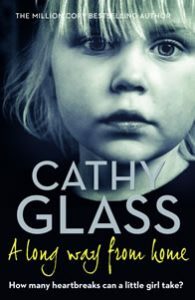 Dear Cathy, You are an incredible person, I have just finished reading Girl Alone and have just started reading Nobody’s Son. I have become an avid reader of your books and told my family. We could all relate to Joss’s experience at a similar age. When I realised your books were real life, it made me feel hopeful. I wish I had someone like you when I was 13. Hi Cathy I’ve just finished reading your book Cruel To Be Kind and I can’t think of anything else. I was wondering if you ever thought about turning it into a film it would be amazing. When I was reading it I could imagine everything and had a lump in my throat. It’s touched me to great lengths. Wishing you the best. I will most definitely be reading many more of your books. 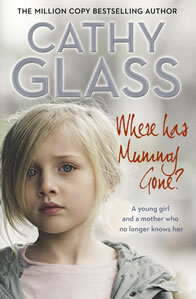 I bought my first Cathy Glass book second-hand. I loved it so much I have purchased many locally and through Amazon. Thank you for all the books you have written. I hope to collect all of them. Yours truly. 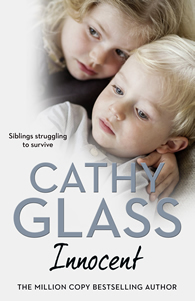 Hi Cathy, just wanted to say how much I enjoyed another of your books, Cruel To Be Kind. Just when I think your books can’t get any better they do. The only downside is I finish them too quickly because I can’t stop reading once I start. Thank you for another great read. Cathy, dear, I’ve just finished reading your book (in Russian translation) about Jodie. Here in Russia we don’t have that global foster care system. Mainly orphans and abandoned children are placed in orphanages, but adoption becomes very popular too. We also have something similar to “foster care” – but it’s more like forever foster care, till 18 y. The child can’t be taken to another family, in 99% from 100 even to his/her birth family because they may have lost their parental rights. Such foster parents get financial support from the government and the child gets a flat and free university education after 18.